Wedding cakes have throughout the years become the focus of a variety of customs and traditions, some of which are still carried out while others have been long forgotten. Thankfully the custom of breaking the cake over the bride's head is no longer practiced as it was in Roman times. After the groom had eaten some of the 'cake' (which was actually barley bread that had been baked especially for the ceremony), he would then break it over his bride's head. This would symbolise the breaking of her virginal state and the subsequent dominance of the groom over her. Story makers have told of small sweet buns being brought to weddings by the guests during the Medieval era in England where custom has it that the guests would then stack them as high as possible in a pile between the newlyweds. They would then have to attempt to kiss over the pile and if successful this was a sign that they would be blessed with many children in the future. During the 17th century a pie named the 'bride's pie' became a popular dish. Ingredients varied in the pie from sweet breads to mince or in some cases it was simply mutton. However it was made the vital ingredient placed inside the pie was a glass ring and the belief was that the lady who was lucky to find the ring would be the next to be married. This custom continued well into the early 19th century. Wedding cakes started becoming really popular during the 19th century and a simple single tiered plum cake replaced the bride's pie. Variations were added to the simple cake and can be considered the first time that cake decorations were used. 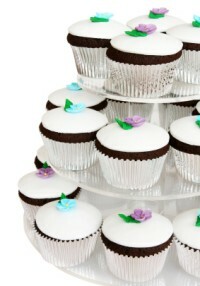 The colour of white wedding cakes appeared in all its symbolical glory in Victorian times. White has always denoted purity and this created a visual link with the bride as the central figure of the wedding. Although white icing was used for cakes before the Victorian times it was then simply used for its colour and had no meaning attached to it. Ingredients for the icing were difficult to find and white icing used only the finest refined sugar. The more affluent the families were the whiter the icing on the cake was. 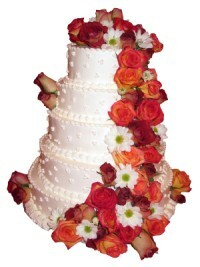 The multi-tiered extravaganza wedding cake was originally reserved for English royalty. Even for the nobility, the first multi-tiered cakes were real in appearance only as the upper layers were fake made of spun sugar. This was done to prevent the upper layers from collapsing into the lower layers until such time as bakers began using pillars to support the top tiers. The first cutting of the cake by the bride and groom is a tradition that still exists today. This custom was originally delegated to the bride where she had to cut the cake to share with guests. The bride had to distribute a small piece of cake to everyone which symbolised her first task as a new wife. As wedding guests grew, so did the size of the cake which made it more difficult for the bride to cut and distribute it on her own. Icing had to be hard enough to support the cake's weight which further hampered the bride with cutting. Out of necessity more than anything else the cake cutting became a joint project and even today the bride's hand will always be first on the cake with the groom's covering it and 'helping' her. This is the first task the bride and groom perform together as man and wife. When the bride and groom feed each other a piece of the cake after cutting the cake this shows the mutual commitment to provide for one another. The tradition of not cutting the top layer of the cake has roots as far back at the 19th century when grand cakes were baked for christenings. With no birth control and the wife's duty to bear children, it was assumed that christenings would soon follow the wedding and the two ceremonies were often linked, as were the cakes. With the ever popular three tiered cake it soon became the custom to the use the bottom tier for the wedding, the middle one for distribution to those that were unable to attend the ceremony and the top tier saved for the pending christening. Superstitious belief of sleeping with a piece of cake underneath your pillow dates back to the 17th century where it was said you would dream of your future spouse and during the 18th century the bride would pass tiny crumbs of the cake through her wedding ring before giving to her guests � they in turn placed these small crumbs under their pillow. This custom stopped after brides began to get superstitious and no longer wanted to take off their wedding ring after the ceremony. 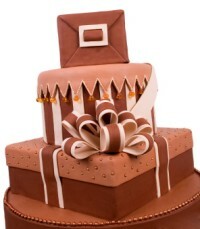 The groom's cake is a tradition that was prevalent in early American ceremonies and is still used today in Scotland. The cake was usually dark (e.g., chocolate) to contrast with the bride's cake and appeared at the reception along with the wedding cake. The origin of this tradition is unclear. Some believe it was to be served by the groom, with a glass of wine, to the bridesmaids. Others believe it was to be saved and subsequently shared with friends after the honeymoon. The design of the tiered wedding cake is believed to have originated from the spires of a medieval church called St Bride's which was in London. During World War II in Great Britain, sugar was in short supply and hard to come by. With rationing it became almost impossible to make icing and cakes were reduced in size. For those brides that could not find icing sugar they had to make do with fake cakes made out of plaster of Paris which were made and shaped to resemble a traditional wedding cake. Today's wedding cakes can be works of art of towering heights or individual cupcakes arranged in tiers to represent the traditional shaped cake. They can be brightly coloured and have an array of decorations from flowers to hearts or from feathers to crystals, the choice is endless and the designs can reflect the couples individuality, hobby or lifestyle.